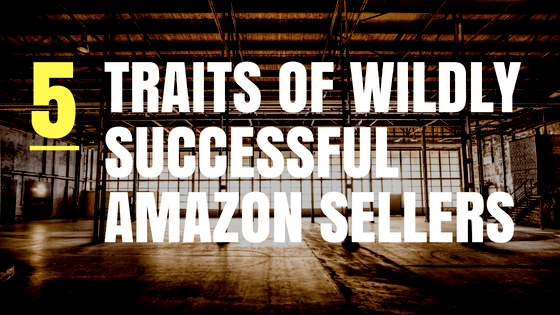 All sorts of people TRY to sell on Amazon but those who succeed at high levels share similar traits. These traits are easy to identify but difficult to emulate. Here are the 5 key traits that I have identified in the most successful sellers I have ever worked with. Also, "most successful" is not synonymous with "highest earning." Sellers who don't have these 5 traits may still make good money, but they are making things more difficult on themselves and not reaching their potential. These principles apply to eBay, Rakuten, Etsy or whatever other online medium you sell on. I just love and know Amazon and so do my readers, so it is the focal point of many of my e-commerce related articles. Selling products online involves risk. There is no guarantee that you're going to make money on each product that you sell. You will have some tremendous failures along the way. Sellers who succeed understand the risks involved, but aren't afraid of making mistakes. They see mistakes as an opportunity for growth. Just like you invest money into yourself through books and courses (maybe), you are investing in yourself each time you make a purchase. If you buy something and it sells, you learn from it. If you buy something and it doesn't sell, you learn from it. Do you see the common denominator? Buying is how you learn. Don't succumb to paralysis by analysis. Be smart, deliberate and trust yourself once you have all the facts. Amazon is far from a "get rich quick scheme." Selling on Amazon however can absolutely be part of a feasible "get rich plan." The ability to delay gratification (spending your profits) is a key to successful online retail growth. High earners understand the power of economies of scale. You need capital to benefit from this. You can get better contracts with suppliers. Money talks. If you come to a supplier with cash in hand you can negotiate much better terms. Also, you won't need to worry about those pesky minimum purchase orders as much. You can take lower margins and make more money. How? You can buy MORE products and FASTER turning ones. Money = Options...More Options = Higher Profit Potential. You won't miss as many opportunities. How many times have you had an amazing opportunity in front of you but no money to act on it? Probably a lot. Patience is big. Very, very big. This applies especially to newer sellers who have little money upfront. When you don't have capital, you have to be very creative with how you get your products. Also, as you scale, there are many ways to create opportunities for yourself, but you need to be able to think outside the box. For example, it is clever when sellers pull their funds together to buy inventory they couldn't get on their own. I know a seller who is regularly able to negotiate better terms with suppliers by giving them something in return. One thing he does is identifies popular products that have poor listings, contacts the supplier and explains that he can help their sales and that all he'd want in exchange is to be able to sell their products. He also uses this method to negotiate amazing prices. Once you commit to Amazon, you commit to rolling with the changes that will come. Embrace that they will come and decide now that you won't allow them to ruin your business. What works today on Amazon may not work tomorrow. Things are constantly changing and good sellers save their energy and adapt instead of complain. Amazon's brand restrictions are a great example of this. Many sellers had to change their businesses almost overnight because of Amazon's abrupt policy change. Another change that caused waves was Amazon's crack down on paid reviews. When sellers complained about how hard it was going to be now and how unfair this move was, all I could do was think, "don't they realize that everyone is affected by this? Do they think people will be buying less now because of this? Who do they think these sales will go to?" Secret Tip: Amazon DOES pick favorites. All changes are based on the customer. Accept this and adapt. It should be no surprise when Amazon makes changes that improve the buyer experience but make things more difficult on the seller. There will always big bigger sellers than you . Measuring your success using others as benchmarks will get you nowhere. A business ran by one person in their apartment may be making more than a company with a 50,000 sq feet warehouse and a payroll that would break the NBA luxury tax. So, instead of giving into the temptation to chase vanity metrics (aka gross sales) to impress your peers, focus on impressing yourself and measure your success on the freedom you are creating for yourself.